Beautifully secluded 18th C fishing lodge with spectacular mountain view. All of our large bedrooms are ensuite and have satellite TV, WiFi and ipod docks. Corriechoille Lodge is an old fishing Lodge in the Highlands of Scotland. We were rated as one of the "top ten hideaway hotels in Scotland" by Peter Irvine, author of the well respected independent guide to everything that's worth seeing and doing in Scotland. 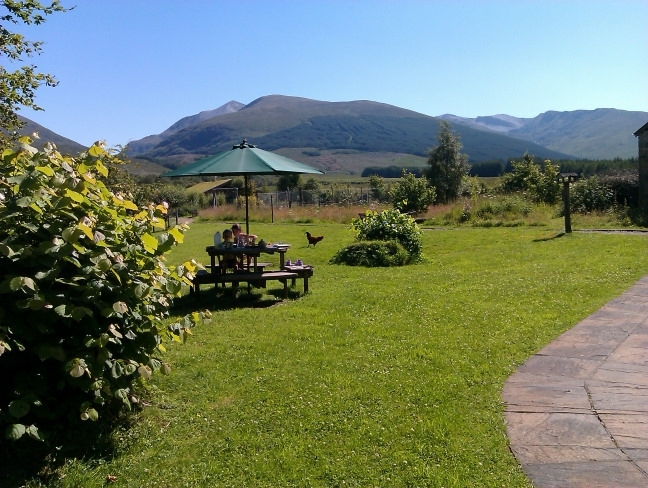 The Lodge is situated near the Highland village of Spean Bridge with a unique location, above the River Spean and well away from any noisy main roads and street lights. It enjoys spectacular and uninterrupted mountain views, peace and quiet and seclusion whilst being well positioned for reaching many other parts of the Highlands. Loch Ness, Inverness, the Isle of Skye and Ben Nevis are just a few of the popular attractions within easy reach. Fort William - with the Lochaber Area, designated the "Outdoor Capital of the UK" - is a short drive away. Perfect for a romantic and peaceful break or for a busy, active holiday. Having been designed as a Guest Lodge, the layout of Corriechoille is well suited to the provision of guest accommodation. The spacious bedrooms all have en-suite facilities, satellite television and ipod docks. Free WiFi Internet access is available throughout. We have a drinks license and a carefully prepared evening meal, using home grown produce whenever possible, is available when booked in advance. The following discounts to our standard rate of £42 per person for B&B apply for multiple night bookings. Discounts are total amounts for the duration of stay (NOT per night).